A few weeks ago while I was on vacation I was catching up on some much needed magazine inspiration time. In my 20s I would run to the mailbox when a new magazine was delivered. And even though I still have that same excitement, it seems now I just can't find the time to sit down and read them. So over vacation I caught up on doing so. Reading magazines dated from summer! Bon Appetit featured roasting citrus for salads, cocktails, and dressings. I was completely intrigued as I love anything roasted, veggies (of course), meats (no doubt), fruit (the best!). And I will share with you something, the more blackened and charred the fruit gets, the better! I honestly had to roast a second pan of citrus as I ate the entire other pan just standing there. This salad is extremely simple with very basic ingredients that you probably already have on hand. Something I am trying to be better about this year. Using what I have, before buying more! Why is that so hard? Anyway, the salad can easily be served as a light lunch, but for dinner, toss in some chicken, whole grains (like quinoa or farro), add some ricotta, goat cheese or feta! And seeds are always great too. Preheat oven to 425 degrees. Toss orange and lemon slices with 1 tablespoon olive oil on a baking sheet. Lay them out in a single layer and sprinkle with salt and pepper. Roast for a total of 15 minutes, until some spots have blackened. Flip them half way through. Remove from the oven and set aside to cool. 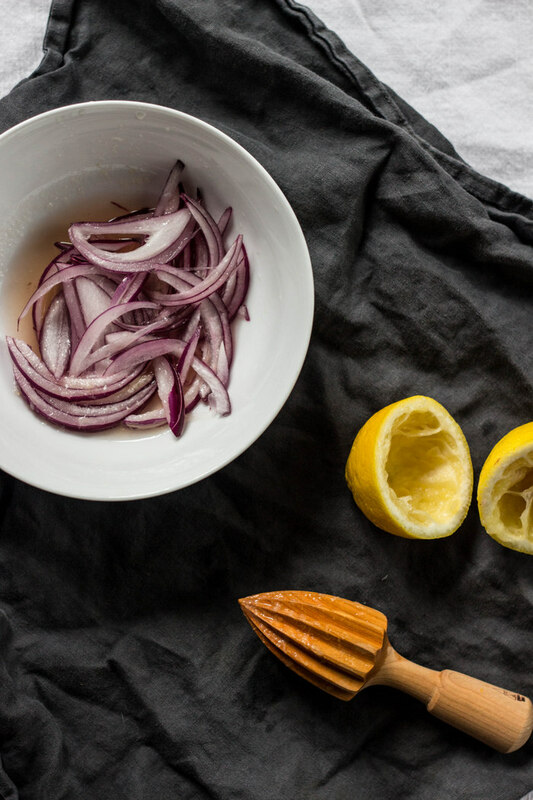 In a large serving bowl, gently mix the red onion with balsamic vinegar, salt and pepper. Toss together and set aside for a few minutes. Add the roasted citrus, arugula and fresh herbs to the bowl. Top with 3 tablespoons olive oil, a little more salt and pepper and gently toss together. Serve with sliced avocado. Feta or goat cheese would be great here too.